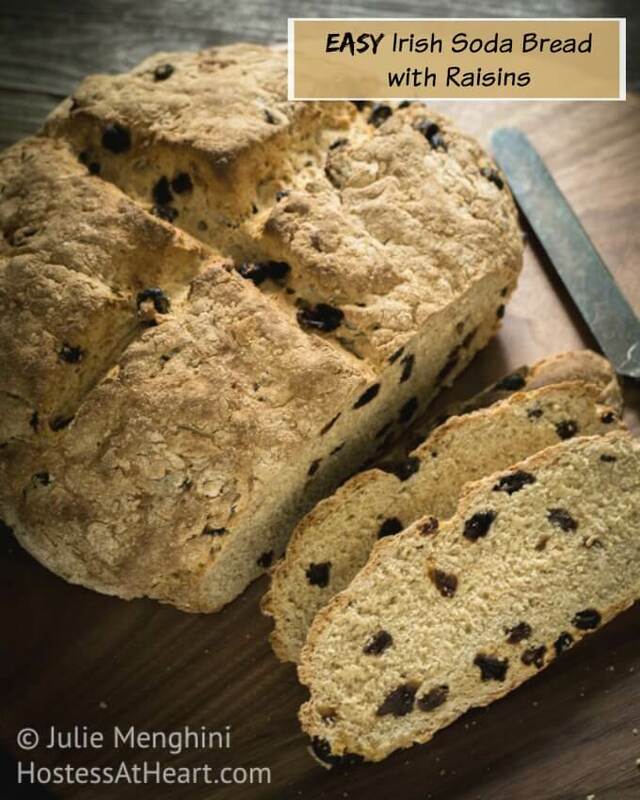 This Super Quick and Easy Irish Soda Bread with raisins recipe is a tasty quick bread that can be baked in any kitchen. 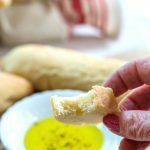 It is the perfect bread with a bowl of stew or when you want hmemade bread in a jiffy! It isn’t only for the Irish! 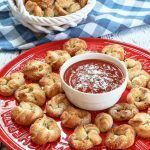 This delicious recipe was first published on 9/30/15 and has been updated to improve the reader experience. John’s mother is Irish (him half), and he said he doesn’t like Irish soda bread with raisins. When I decided to give this bread a try, I thought I was going to have to give the whole loaf to John’s parents. Why would I do something like that? I was so sure that John wouldn’t eat it so I filled this baby full of raisins. His parents, (and I) love raisins in baking. Are you feeling sorry for me yet? Quick bread, means that no yeast is used. Soda Bread relies on chemical reactions between baking soda and the acid in buttermilk (sour milk) to make it rise instead. Soda bread wasn’t invented by Irish bakers. In fact, food historians give credit of first using soda to leaven bread to the Native Americans, who used pearl ash to help their bread rise. Regardless, it’s a very popular bread in Ireland today. Traditional recipes use all-purpose flour. Irish Brown uses a mix of wheat flour and sometimes wheat germ giving it that brown color. Sweet Irish that is sweetened with dried fruit and sometimes molasses. I guess this recipe should be called Irish Sweet Brown Soda Bread? No, I haven’t been drinking any green beer! I pressed my fingers into the top of the bread leaving shallow “divots” similar to what you do to focaccia bread and scored a “cross” in the top of my loaf which is traditional for this bread as well. You can use a sharp or serrated knife or a “lame”. Why does Irish Soda Bread have a cross scored on the top? It’s due to superstitious reasons. Families believed if they cut a cross on the top of the bread that it would ward off evil and protect the household. 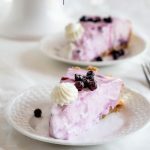 If you like this recipe, please leave me a comment and a 5-star rating! 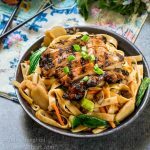 I think you’re also going to love these recipes too! Norpro Unbleached Parchment paper – I use this parchment paper all the time. It withstands a 450°F. Parchment paper can start on fire in your oven if it’s not rated for the temperature you’re baking at! Nordic Ware Natural Aluminum Baking Sheet – These sheet pans are durable and I have four of them so I can get all of my cookies baked in a jiffy! 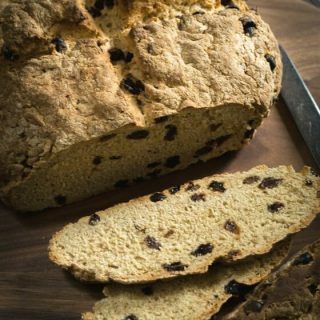 This Super Easy Irish Soda Bread recipe is a tasty quick bread that can be baked in any kitchen. It’s soft and tender and the perfect homemade bread to serve with soup or stew. Combine all of the dry ingredients into a medium mixing bowl. Whisk to combine. Make a well in the center of the dry ingredients and add the buttermilk and raisins. Mix with a wooden spoon until flour is incorporated. Knead a few times by hand if necessary. Turn the dough out onto the baking sheet and form a 2″ thick round loaf. Cut a 1-inch cross through the top of the bread with a sharp or serrated knife. Bake for 30 minutes and then reduce the oven temperature to 400 degrees F for an additional 10 minutes. The bread is done when browned and sounds hollow when tapped or reaches an internal temperature of 210°F with an instant-read thermometer. Cover with foil if bread browns too quickly. Allow the loaf of bread to cool on a wire rack approximately 30 minutes. Store in air-tight container or bag. This bread is best eaten the day it’s made. Freeze any portion that can’t be eaten in 2 days. This bread makes amazing French Toast too! If you think that soda bread is dry and boring, just like what John used to think, this recipe will change your mind. I kept half of the loaf, and even with the raisins, John found himself liking it. It also makes the most amazing toast to go with my morning coffee too. I’m crap at making homemade bread but I am always willing to give it a try! I love Soda Bread because of the tang of it and that crust is making me drool! Thanks for sharing with Saucy Saturdays! Thank you! I’ve heard from several people that had the same opinion of a dry and tasteless bread. This recipe changed my mind. It’s easy, and you can load it up sweet or savory. I appreciate you visiting! This looks so good! I’m a bread addict! I have seen recipes for soda bread but haven’t tried it yet, this recipe looks so great and I will need to give it a go! Thanks for sharing with us at #ThrowbackThursday and hope to see you this week! Thank you! Your Thursday group is a great bunch! Your soda bread looks delicious Julie. I love the addition of raisins, I could just eat a piece. Thanks for sharing. Thank you Sarah! I was really happy with the way it came out! What a gorgeous bread, Julie! Thank you so much! You are so sweet!!! Michael, I appreciate your artmanship, and only hope your get the kudos you deserve. I know how hard it is to be an entrepreneur, and am only more than happy to help if I can. I love my beautiful boards, and would not promote them if I didn’t. I am forcing myself to use them verses letting them hang on my wall to be admired! If you need anything, don’t hesitate to ask! Thank you Judi! I was weaned on oatmeal raisin cookies I think :). This is really a delicious moist bread, and so easy to make. I hope you’ll try it and let me know what you think. Enjoy the rest of your weekend, and I am having a great time hosting! I tried soda bread a couple of times, but I have failed all my attempts. I will try again with buttermilk as you suggest, I really hope to get and amazing “outcome” as yours! Thank you! Try this on Margherita! It is easy, and I can’t imagine anything going wrong. Especially as talented as you are! I’m a total soda bread convert. It can be SO good- not always terrible, dry, & tasteless… 🙂 Yours looks AMAZING! Gorgeous photo & bread board! This soda bread looks delicious, Julie! Thank you Nancy! You are such a sweet girl! Thank you Nancy! It made delicious toast for my breakfast! You know, I don’t think I’ve ever actually tried soda bread! This looks awesome though, I can’t imagine it being boring! Thank you Michelle! Not boring at all! I’ve never made Soda Bread because of the “dry and flavorless” stigma you talked about. You have changed my mind on this one. I can’t wait to give it a try 🙂 Have a great weekend! I’m going to try this one. I also find that soda bread can be dry, love it toasted with good jam and a cup of tea. We are on the same page Liz! This one isn’t dry at all, and it is hearty enough to handle some yummy jam. You know I have never made my own bread of any kind. I really must give this a try! It looks so easy and sooo delicious! I most confess, though …I would have to leave out the raisins, just not a big fan. What do you think about a dash of cinnamon? Oh and I agree with Angie …yes to the butter! 😉 Happy FF! Thank you! Cinnamon would be an amazing addition, and I should have done that too! You can definitely leave out the raisins. You can add anything you want or nothing at all. It is easy Arl so give it a try! I think you will like it. Thank you Angie! Butttterrr is a good thing! Thank you Kaila! Such sweet comments. Photos are always a work in progress. Happy FF to you too! Thank you Petra! I was very afraid that this would be heavy and dry too because of the rumors that I had heard. This is neither. Happy FF to you and I hope you have a wonderful weekend too! Thank you Loretta! I think it’s the same as Irish Soda bread. There must be different variations though because John always said they were dry and tasteless. I almost skipped the challenge but tried it and glad that I did. I love fall because it makes me excited for baking. I fought it’s arrival, but it’s here anyway and now I am ready for it. Drooling at the sight of this, Julie. So good! Wonder how different it is from an egg-free cake, though. Just denser? It is denser Apsara. Definitely a bread crumb. Not a cake crumb. It was a first for me too Chitra. I really enjoyed making it. Thank you Ana! It’s actually very quick and easy too. I’m glad your recipe came out so well! And that you got to keep some of it. Nice board! Thank you! Delicious and easy. Julie, your recipes are always such an inspiration, and the bread looks fabulous! You are just the sweetest girl! We sure connected immediately didn’t we? I really appreciate our friendship, and am honored that you thought of me for this award. I am also so happy that you find my blog pleasing. You know how much work it is, and it’s good to hear such great comments. Here’s to Italy! I’m about 1/4 Irish, but while I’m a mutt, I’m mainly Scandinavian. I don’t think I’ve ever eaten Soda bread, and really had a misconception about it. How does this recipe differ from yours? I found it really easy and yummy. Thank you for stopping by Dawn. More big hugs! 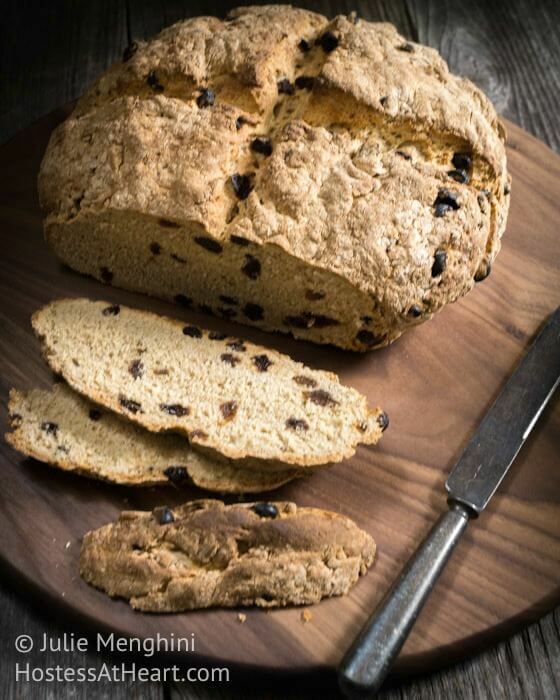 I bought soda bread for a St. Patrick’s Day celebration one year, and really enjoyed it. I’m sure homemade is so much better. Your loaf looks delicious! I would love to have that with coffee in the morning. I am saving this recipe to try. Thanks, Julie! Thank you Shari! It makes a perfect toast with just a bit of sweetness to go with a savory breakfast, or just with a cup of coffee! Thank you for stopping! I really appreciate your continuous support! Meredith, you did a wonderful job instructing us on how to make this bread, and how versatile it is. I will be making it again, and loved this challenge! Thank you for your kind comments and for stopping by! I am in love with this soda bread Julie. Bookmarking this to try. Have always wanted to try one.. Might use with less raisins though. Delicious. The house must have smelled soooooo good! Thank you Sonal! You don’t even have to add raisins. The lady at a bakery here in town said they use caraway seed so you could stuff it with anything. I appreciate you stopping by! I was actually trying to make it the cover photo for today at my group. But I think you have prohibited the copy and paste of your pictures :). If you can send me a picture of the bread with link, I can update on te group for more viewing. Thank you Sonal, I will! Shoot! I love his work. I hope you will post a picture of your bread. I just love seeing other peoples work, especially bread. A beautiful loaf is like a work of art to me. Me too, I completely agree!! I’m not sure if my comment posted just now so apologies if this is a repeat…but yes, I completely agree! What a fun challenge, the bread looks really good and yes toast with coffee, yumm! I love the cutting board will check out that site. Thanks for the recipe, I have never tried this bread and have always thought hmm does it taste like soda! This looks very lovely! Lynz, I thought that soda bread was probably dry and tasted like soda too, but there is only 2 teaspoons in this loaf. I really enjoyed it. Michael does such amazing work with wood. Visit his site and drool! Yes I always thought that too! That isn’t allot at all! I think it would be so good toasted! I went to his site, very nice. This looks so delicious, and your photos are so beautiful, Julie! I love raisins too! <3 I could use a slice of this toasted, right about now! Thanks Pru! You know I’d be glad to share, but it’s already snarfed up. Enjoy your day my friend!